Arlington lies between the Taconic Mountains to the west and the Green Mountains to the east in the Bennington County. Arlington was the Capital of Vermont in 1787. The town is rich in its history and has many unique features, like that of the world renowned Battenkill River that flows through Arlington on its way west to the Hudson. The river is very famous for its trout fishing. According to a popular legend, it is said that the seal of Vermont was originally drawn here, and the tree depicted in the seal stands to this date and lies on Route 313! There are 5 prominent peaks that can be found within Arlington: Grass Mountain, Spruce Peak, The Ball, Red Mountain, and Big Spruce Mountain. The highest among them is Grass Mountain with the elevation of 3,109’. independence. It incorporated the concept of industry and good old Yankee ingenuity. Both New York and New Hampshire were interested in claiming the land of Arlington; however, it was chartered on July 28, 1761 as a part of the New Hampshire Grants by Benning Wentworth, governor of New Hampshire. Some further problems were caused when in 1765, the Province of New York patented land in the area. In 1776, when America declared its independence from England, Arlington became the center of another struggle, as a Church of England stronghold and many of the citizens wished to remain loyal to the king. However, in 1777 Arlington declared itself a republic. It can be well gauged that the development of a politically-troubled area is very difficult to attain easily, and therefore, agriculture played an important role in Arlington’s early years. The farmers who raised Spanish merino sheep for wool enjoyed prosperity. By 1840, Vermont had six times as many sheep as people. However, due to the competition in the market from West and Europe, the prices of sheep wool came down, and by 1840 the farmers of the town were selling their sheep! On November 2, 1843, the Congregational Church Society of Sunderland and East Arlington was organized with nine members. The exhibition is a unique experience in the sense that it does not showcase original paintings, but the rooms are full of reproductions of the illustrator’s works. The work is arranged according to many ways: chronologically, by subject matter, and juxtaposed with photos of the models. A rare delight for an art lover! 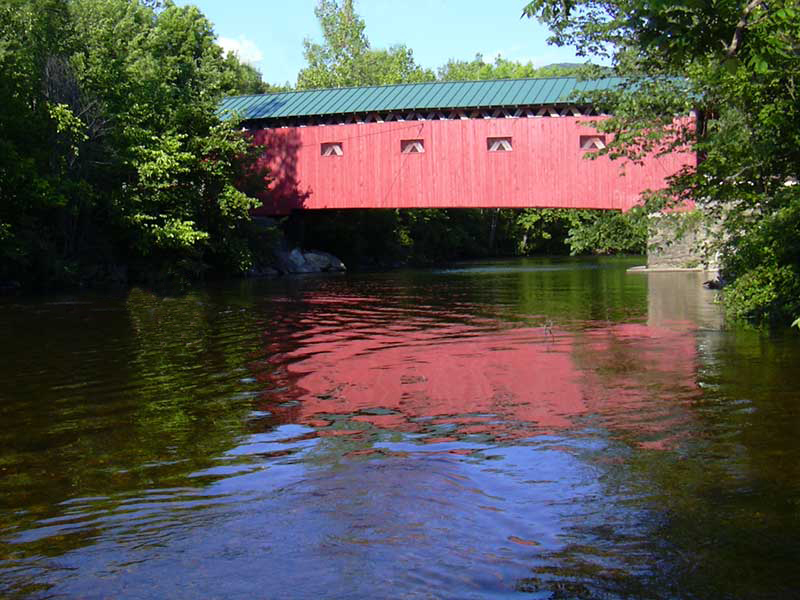 The Battenkill River is a well known river of Arlington and there are many books, articles, and scads that have been written about it by the people who have visited the area and have enjoyed the sight. It is a symbol of fly fishing in New England, and you can never fish alone here! The ripples and pools of the majestic river provide a perfect test to the fishing skills of the anglers. This is a great place for both hikers and backpackers, and it lies between Arlington and Manchester offering great set of possibilities for recreation. Stratton Mountain and Stratton Pond offer diverse choice to the visitors though you will enjoy it whichever way you move forward! West Wardsboro Road is the Daniel Webster Monument, which lies at a short distance from here. This spot marks the spot where in 1840 the great orator spoke to a crowd of 1600 at a Whig (conservative) Party rally. One of the most wonderful things that you will do while visiting Arlington. This is an easy pedal tour along Batten Kill River offsetting the valley and going through the Taconic Mountains. If you are visiting Arlington in the summer, this is the best place to enjoy and spend the time, swimming or resting by the river itself! The campsites at Grout Pond are spread out along a hiking trail, which moved around the western shores of the pond, and you may need to hike your gear in to your tent site. However, once you put this extra effort, you will enjoy to your heart’s content, as the Pond Loop Trail cuts through a dense forest, through which you can behold the beautiful glimpses of the pond as you start out. Parking is available in the small lot past the campground host cabin. One of the most beautiful and continuous run is offered by this class V creek, which runs through the Green Mountains. The Roaring Branch is born in the Stratton Pond area in the Green Mountain National Forest, and is followed by a dirt road for almost of its entire length. It should be noted, however, that the Roaring Branch is an experts-only run that averages about one eddy every half-mile! So do not try it if you are not confident that you can handle the tour on your own!